If you’d like to have plants in and around your home, that require the minimum of looking after, then there is a simple way it can be done. Obtain one of the best self-watering planters that are available and let it water your plants, even when you are on vacation. One of the main things you will notice when looking at the self-watering planters that are for sale, is the huge diversity that exists across all of them. The size, shape, design, color, materials used, and the number of plants that can be planted in them can differ. On the plus side, this should mean that whatever type or style of self-watering planter you want, there should be one available to suit. Beyond that here are some tips, ideas, and information which may help you make that decision. Whether you want a small planter for a single flower, a set of three to add color to your windowsill, or a large box-type planter to be home to a colorful array of different plants, there is almost certain to be one that will accommodate that desire. There are also planters that are stackable, so you can have plants on different levels. 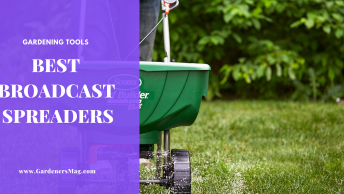 There are decorative planters that are designed for patios, hanging basket-type planters, and there’s even some that have multiple pockets, where you can grow up to 36 different plants. 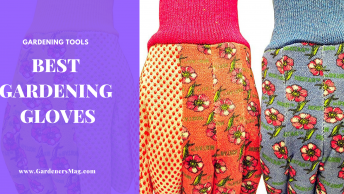 The shapes that self-watering planters come in are exactly what you might find for normal plant pots, so you have round, square, rectangular, and even some which are hexagonal. 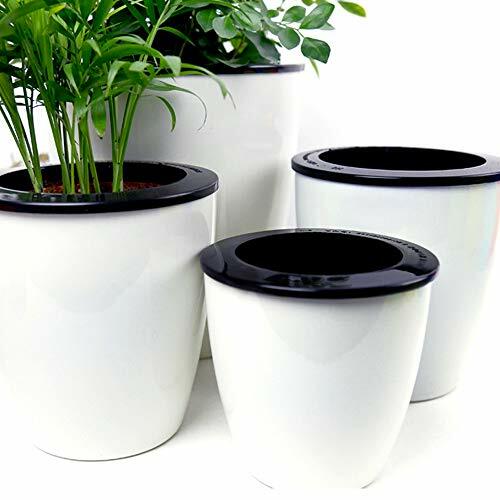 To be honest, unless you have a plant which requires any specific shape or size of pot to grow in, your scope for choosing the size and shape of the planter is limited only by the space you might have available to place it in. Otherwise, you have an almost unlimited array to pick from. The basic principles behind how a self-watering planter works starts with the fact that it contains a reservoir of water. The amount that it can store will obviously depend on the shape and size of the planter. The way in which this water is conveyed to the plants can also differ. One method is where a material will absorb or draw off the water and deliver it to the plants. 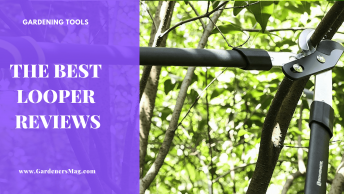 This material is likely to be porous which allows enough water to soak through to benefit the plants, but not too much that might damage or even kill their roots. Another method uses special mats which have capillaries that allow the water through, and many of these also utilize the evaporative nature of water to give the soil moisture. Using a self-watering planter will normally be hassle and problem free, but there is one issue that may arise occasionally, so here is what it is, and how you deal with it. As water is drawn up and evaporated there is the potential for mineral deposits, such as salt to build up. This is especially the case if you use any kind of water softener in your system, as the mineral levels within this will be very high. These minerals can literally poison your plants, but this is not the only way that minerals build up. Using water-soluble fertilizers in self watering planters can also be the kiss of death for your plants and flowers, as they also cause salt to build up over time. There are a couple of ways to stop this from happening. The first is to use lots of compost in the soil mix at the bottom of the planter. As the compost contains tons of nutrients there is less need for any fertilizer. The other way is to give your planter a once a year soaking with a hose or watering can during the summer. This will flush out the mineral buildup, provided you tip out the water in the planter when you are finished, and refill it with fresh water. The age-old problem of knowing when, how often, and by much you need to water indoor plants can be frustrating and confusing. Sometimes it is even enough to stop people bothering with plants in the first place, which is a great shame. Thankfully there are now ways to water plants which are a lot more convenient, and one of them is this self-watering planter from Window Garden. It is suitable for all types of plants including flowers and vegetables, and it can also be used for seedlings as well. The basis upon which it works is called hydroponics, and this system provides the roots of your plants the perfect combination of water and oxygen that they require to survive. Not only does it help them survive, but it promotes their growth and allows their roots to spread naturally. To assist you in your mission to water your plants effectively, the planter comes with a water level indicator. This makes it easier for you to identify when the water level is low, and that you need to add water to the planter. However, this will not have to be done as often as it would be with standard plant pots. For starting purposes, the planter comes with 2 quarts of fibrous soil which you can use to plant something right away, however, the nutrient level of this type of soil is low, so you are advised to add fertilizer to boost the number of nutrients these plants receive. As well as buying one of these for yourself, they also make excellent gifts, and they can come in any one of seven different colors. This is a very innovative and unusual design for a self-watering planter, but it is also a very effective one. The patented stackable configuration works on the principle that you pour water into the top tier, and it then flows down to the other two tiers so that everything gets watered from top to bottom. Any excess water is collected in the tray that the planter sits in. You certainly have no lack of options in terms of what you can plant. With three tiers and enough room to plant 12 different varieties, you’re limited only by your imagination. You could plant cacti, flowers, herbs, vegetables, and even fruit plants such as strawberries. The three tiers also give you scope to create a very colorful display, and as the flower and plants bloom from season to season, it could become almost kaleidoscopic. Each planter and the tray at the bottom are made from plastic, so they will be durable, and very easy to clean. The material is also UV protected, so there should be no fading if they are left out in the sunlight. 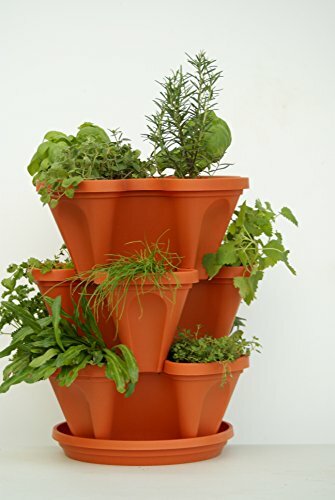 If any of your friends or family enjoy flowers or plants, this would make an excellent gift and you even have the choice of three colors, which are terracotta, stone and green. This self -watering planter comes with everything ready for you to simply add the soil and the plant or plants that are going to grow in it. 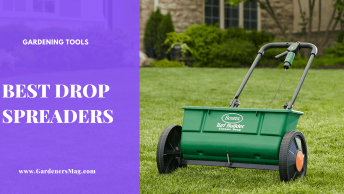 This model has an 11-inch diameter which allows you a fair degree of leeway in terms of the number of plants you might want to use it for. There are two others available; one smaller at 5 inches in diameter and the larger one is 13 inches. You also have a choice of two colors, namely latte, and clay, which are fancy names for light green and red. 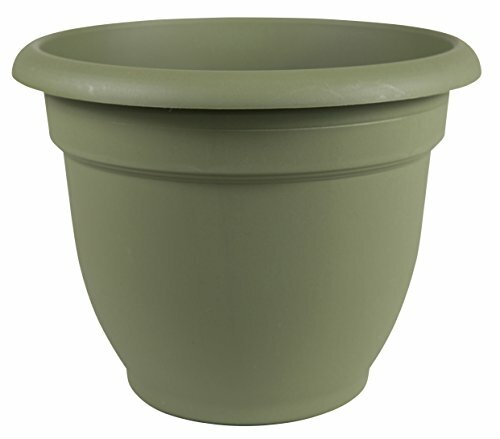 Whichever color you choose, the exterior of the planter has a smooth finish, but it also has some very subtle markings which take away some of the sterile plastic look it has. The plastic material is also useful for releasing heat when it has been sitting in sunlight. This is important as it prevents excessive evaporation of the water from the soil and the reservoir. Near the top of the planter, there is a wide lip, which has two benefits. The first is that it makes it easier for you to lift the planter and move it. 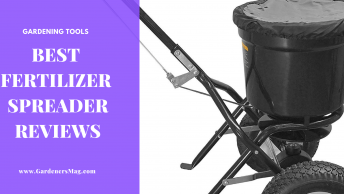 The second is that it is wide enough to allow you to loop string or twine around the diameter of the planter and hang it from a hook, just like a hanging basket. Another very useful feature is the opening near the bottom of the planter. This lets you see the water level in the reservoir at the base, and can therefore indicate when it is time for you to refill it. With this product you don’t just get one self-watering planter, you get three self-watering planters, which is great if you have more than one or two flowers that need planting. They work on the basis that water is stored in the base, and this is drawn up by the plant or plants as they need it, via a cotton rope which is submerged in the water and in contact with the roots of the plants. The reason these are so effective is the difference in size between the diameter and height of the inner basket and that of the outer shell of the planter. 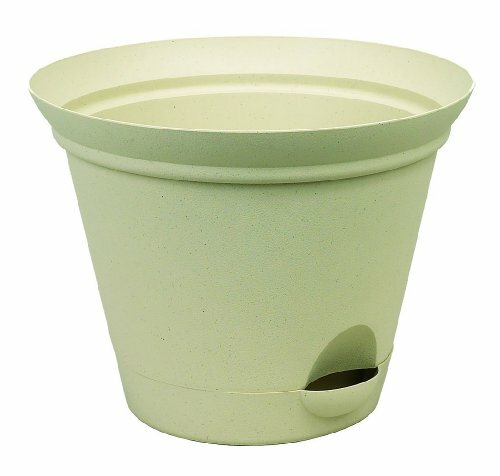 This allows for more water to be stored, therefore the time between you having to fill it with water is longer than with many other self-planter products. This time can be as much as 10 days between watering, depending on the type of plant, and the conditions. Obviously, if it is outside and the weather is very hot and sunny, the plant will require more regular watering, than if it was sitting indoors. One point to note on getting three is that these planters come in three different sizes; however, the three you order will all be the same size. The one we are reviewing is the large size, but medium and small sizes are also available. You could order more than one set, and with a combination of set sizes so you have the potential to create a very impressive display using plants and flowers of different sizes, and colors. 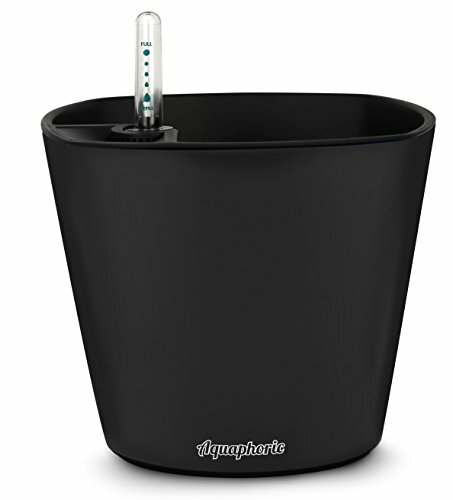 This self-watering planter from Bloem Fiskars has as simple a design as you are likely to see, but as we have said many times when reviewing products, it is often simpler designs that are the most effective. On first sight, it looks like a normal clay plant pot, but on closer inspection, you will see it made from plastic. The matte finish gives it a more rustic, and appealing appearance. Plastic also means it will be easy to wipe clean. The planter has UV protection, so it can be left outside, without any risk of the color fading in the sunlight. 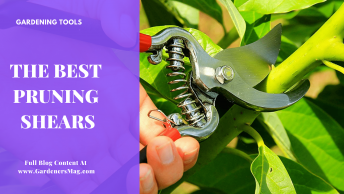 The self-watering process is a simple one, but you need to understand it so that you can set up the planter correctly to give your plants or flowers the best chance of thriving. There is a disk which is placed into the base of the planter, and on top of this, you place the soil into which your plant or flower is going to be planted, or the soil it’s been growing in, if you are transplanting it from somewhere else. Once everything is in place, you can then start to water the plant. This water will penetrate the soil, and seep through the disc to form a reservoir underneath it. This reservoir will be at least 1 inch deep. This is where your plant or flower will draw up water via its roots when it needs to. It can do so, due to the disks porous channels which act as a wick to soak up water. This process means you do not have to water your plant every day, or possibly every week, as the reservoir provides it with water as required. 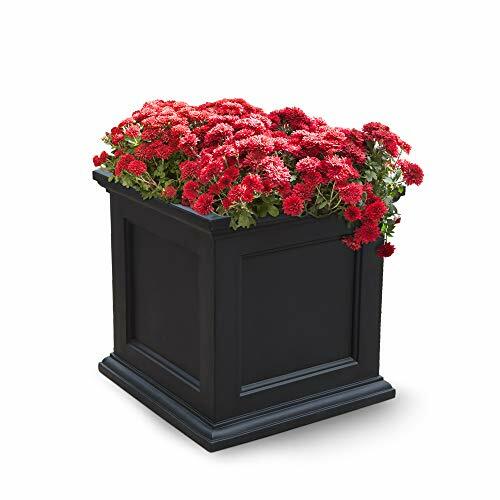 For those who want a planter that looks more like a traditional flower box, then this one from Mayne will surely catch your eye, given its square shape and right angles. This one is designated as having a ‘New England’ look and with its traditional design, you can understand why. The construction of the planter involves it having two layers, which create the space at the bottom for a water reservoir. This reduces the frequency with which you need to water your plants, as they can draw water up from the base. One danger of this type of watering system is that of drowning your plants by adding too much water. To prevent this from happening, the planter has an overflow hole, which allows excess water to drain away. Although at a distance you might mistake the exterior as being made of wood, it is actually a high-grade polyurethane they are made from. The immediate advantage of this is it makes the planter easier to wipe clean. More importantly, the resins within the material contain UV inhibitors which help reduce any fading effects that that strong sunlight might have on the exterior. This is particularly necessary due to the black color of the planter. Mayne produces several planter products and has a great reputation for doing so. This may be due in no small part to the fact that they offer a 15-year manufacturer’s warranty against their planters bulging, cracking or fading. What a diverse assortment of self-watering planter we have looked at, with all sorts of shapes, sizes and colors to choose from. Despite this, it didn’t take us long to choose our best self-watering planter, and that is the Mayne Fairfield 5825B Patio Planter. We love it when something which has an important practical purpose can be combined with a pleasing look, and the square traditional styling of this does that perfectly. It has a very impressive 15-year warranty which tells us it is designed to last and adds to the overall first-class appeal of this product.